RED DAWN: The display covers Torrox’s historic centre. 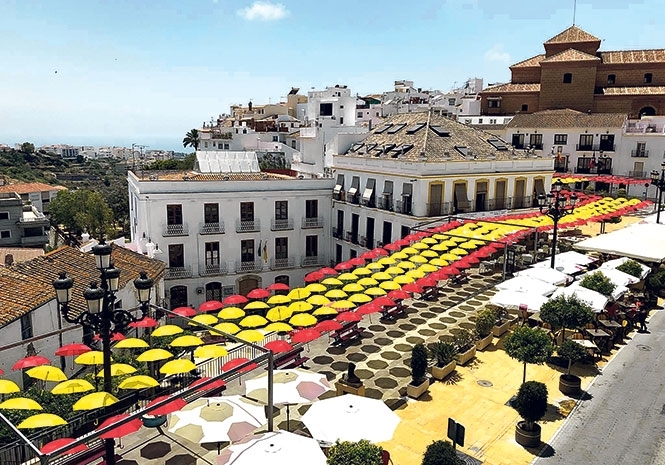 TORROX Council has unveiled a giant Spanish flag made out of more than 1,000 red and yellow umbrellas placed to mark this year’s World Cup. The instalment is the latest in a series of similar works made from umbrellas that have been put up since summer 2015. It stretches down into the town from the Plaza de la Constitucion. Oscar Medina, the town’s mayor, officially presented the display to the public last Tuesday. He said the umbrella installations previously put up had become a ‘great red flag’ to coincide with the football tournament currently taking place in Russia. “This new display shows our eagerness to offer our support to the Spanish team,” he said. The mayor added officials hoped the display, which costs some €20,000 a year to install, would attract more visitors to Torrox.